The Zodiac WX from Northbound Networks is Dual-Band AC1200 AP that includes 2 Gigabit Ethernet ports and support for PoE. It also integrates Zodiac OpenFlow® engine with OpenWrt operating system. The Zodiac WX works with any standard OpenFlow® 1.3 compatible controller and appears to the controller as a 65-port Ethernet switch. This post explains how to build a virtual machine to control the wireless AP with a Ryu controller running SimpleSwitch2 (SS2) application from Inside OpenFlow. I have chosen Ryu to control the AP because it supports OpenFlow 1.0, 1.2, 1.3, 1.4, 1.5 and Nicira Extensions. Moreover, it is freely available under the Apache 2.0 license. The Zodiac AP will operate in the LAN environment shown in the figure below. So save space, I’ll defer describing how to configure the AP to another post. I recommend, however, that you ensure the Zodiac WX works as a standard AP before you proceed. You can do that by un-checking “OpenFlow Enabled” option in the Controller tab and connect some clients. I’ve created a VM based on the Ubuntu desktop version 16.04.3. Use these instructions to do the same using hyper-v or vmware. Mine uses 1024MB of RAM and 1 virtual processor. I used the username “ryu” in my configuration , but you choose a different username. Your Ubuntu VM (or the physical machine, if you choose) will likely get a dynamic IPv4 address using DHCP. To ensure that your Zodiac-WX always finds the controller, you have to configure a static IP address by adding the following lines to the file “/etc/network/interfaces”. Finally Verify that you can ping the ZWX before you proceed. If you get complaints about missing packages, install those until the above command runs without errors. SimpleSwitch Reimagined (SS2) is a L2 switch controller application for Ryu created by Inside OpenFlow. SS2 has a 4-table flow pipeline. Using multiple tables allows a controller application to implement more logic and state in the switch itself, reducing the load on the controller. Start by cloning the SimpleSwitch2 code from Github. Hit CTRL-C before you continue the following steps. The SS2 crashes occasionally (I’m not sure why yet) so the Restart options above ensure that the service restarts promptly. If everything went well, the controller should populate Zodiac WX with several flows. 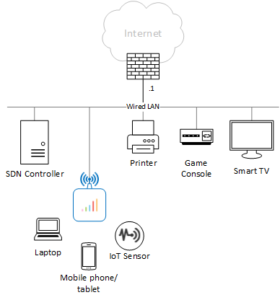 Your wireless clients should have full connectivity to the network.